Posted on Thu, Mar 17, 2011 : 12:02 p.m.
Ann Arbor may have a strong German heritage, but on this day, everyone in town is Irish. Not that it really matters, because we know the Germans and the Irish agree on the most important thing: beer. Maybe potatoes, too. You ever have the potato salad at German Park? Man, that stuff is good. But I digress. This is the second year my handlers at AnnArbor.com have allowed me to desecrate these hallowed pages with commentary on my dawn-to-dusk (or dawn-to-end-of-happy-hour, anyway) St. Patrick's Day odyssey. I gladly do it for all the working stiffs trapped in their cubicles — though in our fabulous economy I suspect there may be fewer of you this year than last — while we dedicated day drinkers spend our time living the dream. They don't call it Kentucky Breakfast Stout for nothing. 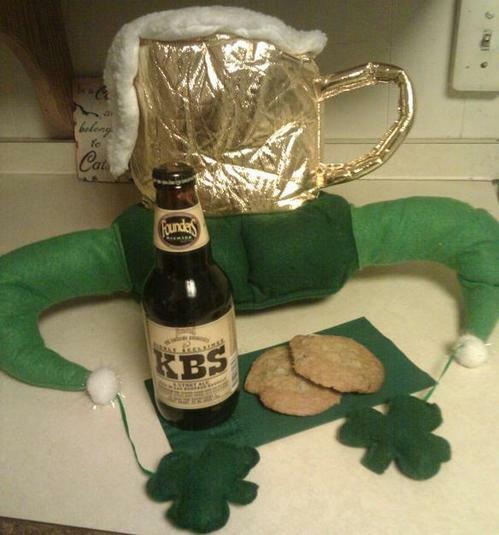 A beer to begin, some cookies courtesy of Patti Smith and the World's Stupidest Looking St. Patrick's Day Hat. You think I'm joking, but let me assure you my credentials to be your guide to vicarious St. Patrick's living are impeccable. First, I like beer as much as any Irishman (or -woman) or German, though I prefer it amber, brown, black, or even yellow — green is for amateurs. Second, last year I drank from 7 a.m. to last call, which should — though I can't promise to do that ever again — count for something. And finally — well, what else are you gonna do today, work instead of goof off on the Internet? 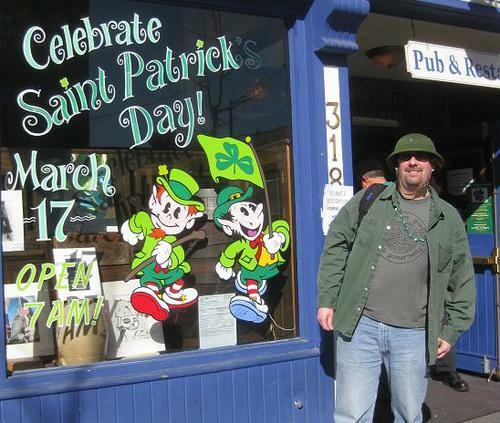 Might as well follow me on the Twitter (@allthebrews) as I document St. Patrick's Day 2011 for posterity. Or at least, you know, spend the day getting drunk while you're stuck in that cubicle. All right, time to get to it. For others lucky enough to be out and about instead of chained to a desk, give a shout out with the hashtag #stpata2 so peeps can follow you in the Twitter box below. And be sure to look for me. I shouldn't be hard to find — if there's anyone else out there with uglier headgear than me, I'll... eat my hat. You can also check out Angela J. Cesere's slideshow of images from St. Patrick's Day in downtown Ann Arbor here. David Bardallis is a freelance writer and editor, blogger, bon vivant, and man about town. Visit “All the Brews Fit to Pint” at AnnArborBeer.com, follow @allthebrews on Twitter, or join the "All the Brews Fit to Pint" Facebook page. Email your beer-related thoughts to annarborbeer@gmail.com. Fri, Mar 18, 2011 : 3:06 p.m.
No need to subject readers to my private moments! :) Also, thanks to AnnArbor.com for again hosting this little blog. There's more than a few people on this site who seem to think they could run a better news organization and, who knows, Internet resumes being what they are, maybe some of them are even right. But the folks here do a good job and are fun to work with, so thanks again! Fri, Mar 18, 2011 : 2:39 p.m.
Let's hope the tweeting doesn't continue from the bathroom today. I have a feeling you'll get to re-experience the corned beef, cabbage, and beer, olfactorily at least. Fri, Mar 18, 2011 : 2:32 p.m.
Fri, Mar 18, 2011 : 12:19 p.m.
Well this ended abruptly. I am disappoint as I was hoping for some epic winning beer-fueled-mayhem tweets as the evening reached its zenith instead. Last year's blog was better. Call me a troll and a hater if you will but, FAIL. duh. Fri, Mar 18, 2011 : 1:04 a.m.
Thu, Mar 17, 2011 : 8 p.m.
@willywonka, Yes, it's true. Those 14 people sacrificed their jobs so I could drink, and I salute them for their altruistic action. You should show some respect to them as well, for their selflessness. Or maybe these things have nothing to do with each other. Thu, Mar 17, 2011 : 7:11 p.m. I don't see any hellraising yet! Plenty of beer drinking though. I don't know how you can drink dark beers all day and not end up puking your guts out. I can only imagine the hangover tomorrow. Thu, Mar 17, 2011 : 6:40 p.m.
@willywonka I think this guy works for beer... ya' get what ya' pay for, ya' know.? Thu, Mar 17, 2011 : 5:50 p.m.
Really? This is why AnnArbor.com canned 14 people, so we can have live blogging of someone drinking? If this is local news, I'll eat *my* hat. Thu, Mar 17, 2011 : 4:32 p.m. I can tell by Dave's physique that he is a dedicated beer drinker. But is he a hellraiser? We'll see! Thu, Mar 17, 2011 : 2:41 p.m.
Dave is Ann Arbor's equivalent of Squire Will Danaher from The Quiet Man. It takes a tough man to drink some tender beer. Thu, Mar 17, 2011 : 2:09 p.m. It's a tough job but you seem up to the task! Go for it!